Or how about dress like one? Mercy Vintage recently hosted a pop up shop featuring limited one of a kind items from the closet of Kim Gordon, rock icon from Sonic Youth. It was a hot summer evening as a small crowd of people gathered into the cozy boutique. With a glass of spiked lemon ice tea in hand, and a plate of delectable pickled veggies in the other, my eyes devoured the sights of Kim’s clothes – all in perfect vintage condition and only at an arm’s length away. Marc Jacobs, Pucci, and Alexander Wang were amongst some of the designer duds for sale, as well as other vintage items. I also couldn’t help but sift through the racks of Mercy’s regular merchandise. They have an amazing collection of dresses ranging from casual cotton day dresses to fancy chiffon and tulle fit for prom – no wonder I love shopping here. All of the frocks were so darling and I swear I heard one call out to me, “Chic Vic!” To my surprise, it was not a dress, but Brandy, the fashionista-confectionista blogger from Will Bake for Shoes. We oogled over which of Kim’s pieces were our favorites. Alas, I was good to my pocketbook by not spending a dime, but I assure you this is one act you don’t want to miss out on. Cute party dress? Check. Fancy handbag? Check. Hair perfectly coiffed and makeup flawless? Double check. 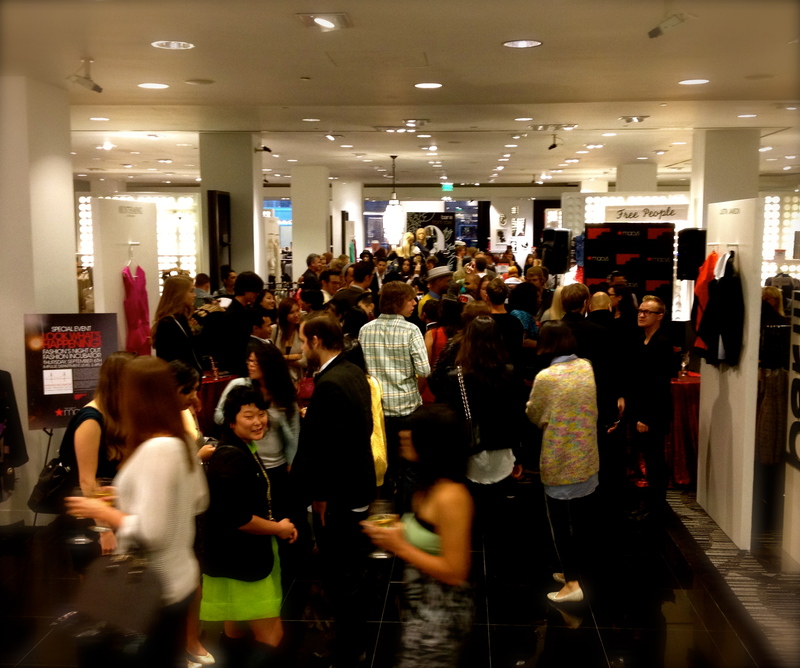 On September 6th, 2012, all of San Francisco’s fashionistas, stylish cats, wannabes, and socialites were dressed to impress as they attended Fashion’s Night Out (FNO). Boutiques, shops, and department stores took part in this fourth annual national event to celebrate fashion at its finest by offering an evening of shopping promotions, events, cocktails, and music. The crowd was diverse, ranging from young and old, the fashionable and the not so fashionable, native San Franciscans, and tourists from halfway around the world who just happened to be at the right place at the right time. “I think it’s a great how everyone comes together to celebrate fashion, dressed in their best. It’s also great to see all the new styles that are coming out,” said Ashley Jones, who has modeled for FNO for the past two years. 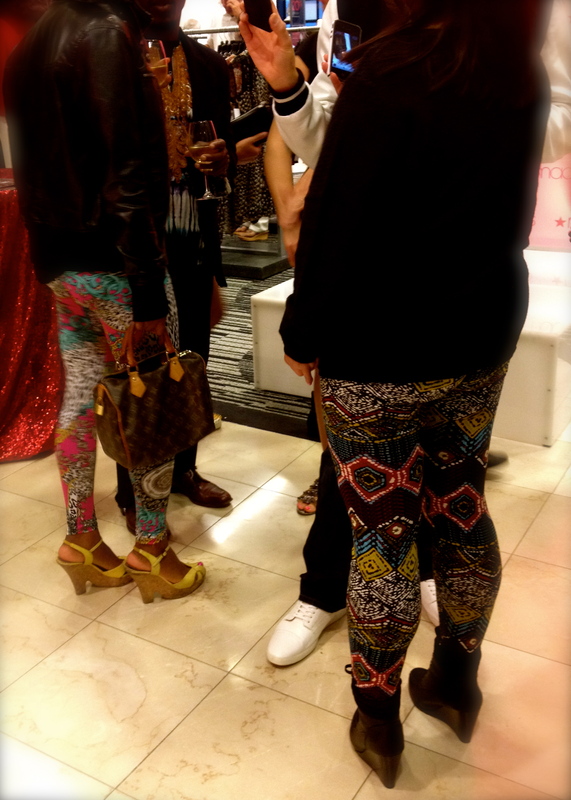 As I fought my way through the throngs of stylish folks, I couldn’t help but notice the trend of printed pants among the crowd. 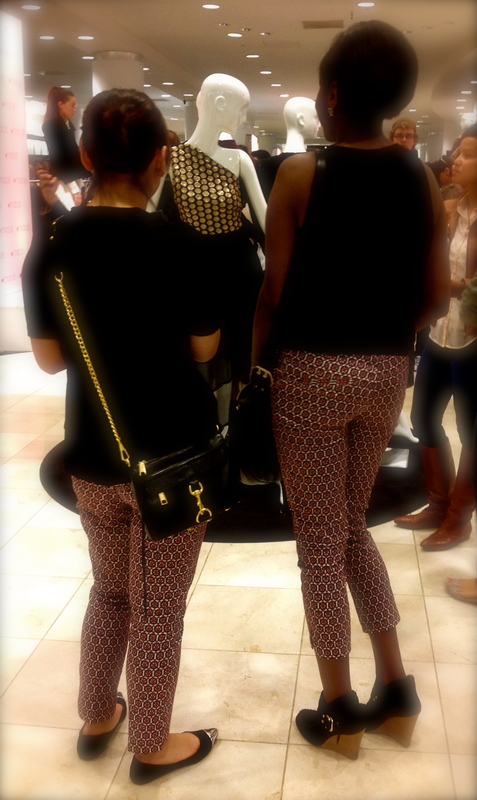 Whether it was geometric or tribal, from cropped trousers to stretchy leggings, it was clear that the printed pant is this season’s must have. What a perfect way to pack some punch into an outfit! I suddenly felt bland in my chosen outfit for the night. Note to self: must stop by H&M later to pick up some fancy pants. 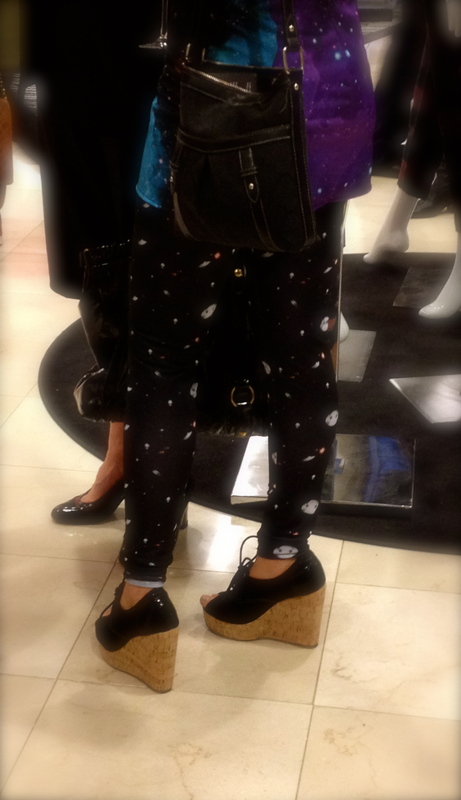 The evening wouldn’t be complete without checking out Macy’s on Union Square. I made a beeline to the Impulse section on the third floor, where six budding designers in residence showcased their collections. As a part of the Fashion Incubator, a non-profit program run by Macy’s Union Square, the program aims to turn fashion designers into successful San Francisco entrepreneurs. The simple, yet alluring silhouettes of Tony Sananikone’s line, “Sounthavong” caught my eye. Dressed in a sleek black Hugo Boss suit, accessorized with his own designed leather flower, Tony described his favorite designers. “I am in love with Chloe. There’s something simplistic about her and also in European designers. There’s something that’s very high quality about it and that’s something I kind of want to portray in my aesthetic,” said Tony. Working my way through the crowd, I was drawn to the intricate and delicate detailed designs of knitwear from the line, “Mansoor Scott,” which is a collaboration between designers Sabah Mansoor Husain and Bethany Meuleners. 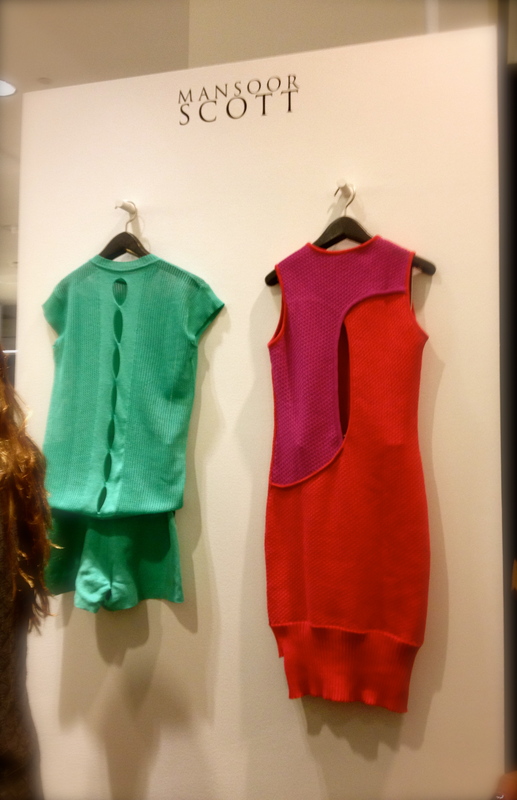 Their collection looked so comfortable and soft, I had to restrain myself from grabbing the sweaters right off the display. 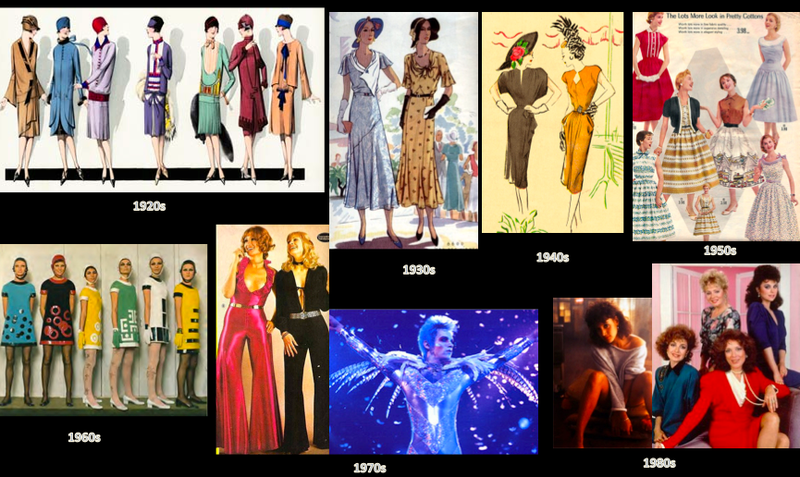 As a student myself, I wanted to know what kind of guidance these designers would give to someone who wants to study fashion design. “When you want to study design, it can be a little scary. Stick to it, and keep your own ideas and concepts, and don’t try to change it to what fits to everything else,” said Bethany. The single most exciting moment of their design career so far? “New York Fashion Week!” exclaimed Sabah. Great words of wisdom, and it certainly looks like staying true to their ideas has worked in their favor. By the end of the night, my feet were aching in my cute shoes. Oh, the things I do for fashion! See you next year, FNO, hopefully in New York or Los Angeles!